Day at the Races is a battle minigame in Mario Party 2. Random Ride, a minigame from Mario Party 5, is very similar to Day at the Races. The name is derived from the 1937 film A Day at the Races by the Marx Brothers. Participants on the start line, preparing to begin the race. 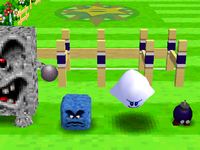 The minigame involves the players choosing one of the four characters, each with their own advantages and disadvantages. When playing this game during a party, turn order is determined by the current standing in reverse order. Whomp – Walks fast but falls over and takes a long time to get up. Thwomp – Rises above the floor and jumps forward but then drops down and takes a long time to get up. Boo – Disappears and then reappears a lot further than before, but faceplants on the ground sometimes. Bob-omb – Starts a spark running from its fuse and moves very fast but occasionally falls over. 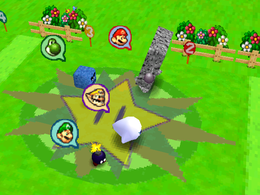 Once the players choose their characters, the minigame announcer will alert the players to start the race. Once the race starts, each of the four characters race to the end, and the first character to cross the finish line wins the minigame for that player. Game Rules – "The race is about to begin! Pick the character you think will reach the finish line first... And they're off." Advice – "Just because a character is ahead doesn't mean it will win... Watch out for come-from-behind victories!" German Wett-Rennen Pun of the words "wetten" which means "(to) bet" and "Wettrennen" which means "race"
This page was last edited on April 13, 2019, at 15:02.